Pumice Pozzolan: Why Specify Hess Pozz? We know most of you reading this are already well-informed as to why pozzolan is such a key ingredient in today’s high-performance concretes. 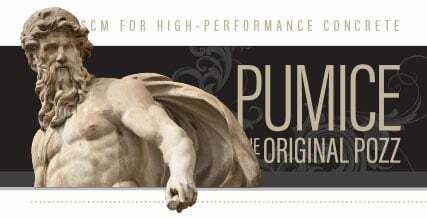 What you may not know is how well our natural pumice pozzolan performs compared to other pozzolans on the market. The information below quickly details the most important benefits of using pumice pozzolan in concrete formulations. We've got the research to back it up as well. The pozzolanic reaction between a Hess Pumice Pozz and calcium hydroxide happens after the C3S and C2S in the cement begins to hydrate, releasing calcium hydroxide as a by-product. At the early stage of curing, compressive strengths will be lower than reference OPC. Over time, the natural pozzolan continues to react with the calcium hydroxide produced by cement hydration and increases the compressive strength by producing additional C-S-H. Sometime between 28 - 40 curing days, the HessPozz/OPC mixture begins to exceed reference OPC in compressive strength. After 56 days, strengths may exceed reference OPC by 15% or more. The pozzolanic reaction continues until there is no free calcium hydroxide available in the mass. Long term compressive strengths may exceed the reference OPC by up to 50%, depending on mix design. Concrete deterioration caused by the penetration of chloride occurs when chloride ions react with calcium. The expansion of hydrated calcium oxy-chloride enlarges micro-cracks and further increases permeability, which in turn causes even greater chloride penetration and related damage from freeze-thaw cycles. When 20-30% natural pozzolan is added to cement, it will react with almost all the free calcium hydroxide and form a denser less permeable paste, and thus a higher strength. With the addition of an UltraPozz (3µ) the concrete becomes nearly impermeable. Thus, the penetration of chloride can be greatly reduced and the few penetrating chloride ions cannot find any free calcium hydroxide with which to react. 1) Free calcium hydroxide and sulfate combine and expand to form gypsum (CaSO4-2H2O). 2) Gypsum and calcium aluminate hydrate (C-A-H) combine to create a late-forming, damaging ettringite (C3A-3CaSO-32H2O). 3) Gypsum and calcium carbonate combine with C-S-H to form a destructive thaumasite (CaCO3-CaSiO3-CaSO4-15H2O). All three of these reactions result in the expansion and disruption of concrete. Thaumasite, in particular, is accompanied by a severe damaging effect which may transform hardened concrete into a soft, pulpy mass. As in the case of chloride attack, the natural pozzolan will 1) decrease permeability and thereby reduce or eliminate chemical permeation into the concrete, 2) lock up free calcium hydroxide into C-S-H, virtually eliminating the threat. University of Texas-Austin research quantified HessPozz enhanced concrete at a Class 3 Sulfate Exposure per ACI 201: Guide to Durability (at 15% replacement). Hess Natural Pozzolan is crushed to a fine particle size resulting in dramatically increased reactive surface area. The HessPozz is able to readily react with calcium hydroxide (CH)* as it becomes available, and thereby traps any present alkali inside the densified cement paste. The addition of a Hess UltraPozz (3µ) speeds this reaction due to its extra ‘high reactivity’ index. The dense paste and the resultant alleviation of capillary action virtually eliminates alkali-silica reactions and efflorescence. As the preceding data indicates, concrete made from a pumice pozz/Portland cement blend can protect steel reinforcement by creating a matrix so densely packed that liquids and/or gases cannot penetrate to cause the steel to corrode. Where very high strength and superior durability are key, the addition of a Hess UltraPozz (3µ) can enhance both strength and the protection of rebar much like a silica fume (without the hassle). Also, the environmental friendly HessPozz and UltraPozz do not carry the carbon footprint of a Metakaolin as it has been naturally calcined by Mother Nature. A unique characteristic of pozzolan is its inherent ability to actually heal or re-cement cracks within the first 30-60 days after hydration by means of continuous pozzolanic reactions with the excess calcium hydroxide produced during the reaction between water and cement. 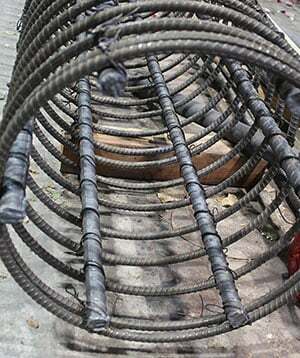 This results in the filling up of many of the micro-cracks inside the hardened concrete matrix. Experiments show that replacing 20-30% Portland cement (OPC) with a HessPozz (DS325) can reduce the expansion and heat of hydration by as much as 40% of normal. 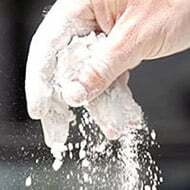 Less heat is produced when natural pozzolan reacts with the available calcium hydroxide. Natural pozzolan not only decreases the overall heat generated by cement hydration, it also delays the time of peak temperature. A graphic illustration of the ‘heat of hydration’ for a HessPozz–OPC cement mixture is extended longer and lower to form a much more moderate curve than the ‘heat of hydration’ curve for OPC itself. The leaching of water-soluble calcium hydroxide produced by the hydration of Portland cement can be a significant contributor to the formation of efflorescence and overall porosity in the concrete. The amount of “water of convenience” used to make the concrete workable during the placing process creates permeable voids in the hardened mass. 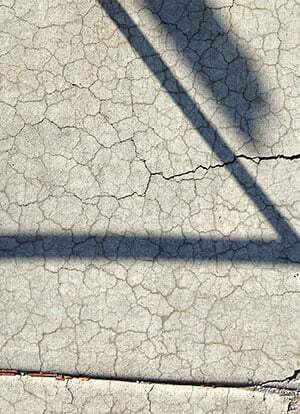 Additional porosity (and efflorescence) is created as the calcium hydroxide, a by-product of the hydration reaction, migrates to the surface of the concrete via capillary action. HessPozz will effectively eliminate this by reacting with the calcium hydroxide to form C-S-H before it migrates to the surface of the concrete. The benefits and characteristics of natural pozzolan mentioned above clearly illustrate why the ancient structures built by the Greeks & Romans have survived over 2000 years of weathering—the Pantheon, their aqueducts, cisterns, piers. HessPozz has a specific gravity of 2.35 g/cc. Most other pozz products are 2.6 g/cc or higher. How does this help? It means you can use less HessPozz, by weight, to achieve the same or greater benefit as other pozz products. If you normally use 25% pozz to achieve your desired specifications, use 20% HessPozz. Currently using 20%? Use 15% HessPozz. HessPozz products are white in color, scoring a GE brightness of 84. Want to pour a beautiful, light-colored, pozz-fortified concrete? Look no further than HessPozz. Hess StandardPozz (14-16 microns) and Hess UltraPozz (2-4 microns) provide two particle size grade options to meet a variety of concrete mix design needs. Hess UltraPozz. Used when high early strength is needed (at 90% of OPC on day 1; at OPC strength on day 7, and surpassing OPC by 40% at day 28. Along with the accelerated rate of strength gain, UltraPozz ultimately delivers the greatest finished compressive strength and density. Also enhances cement hydration kinetics and pozzolanic reaction rate. Class 3 sulfate exposure. Provides superior ASR mitigation, though no better than Hess StandardPozz—both flatline expansion. Hess StandardPozz. Economical choice for typical concrete applications. Exceeds OPC strength by day 28 and by almost 40% at 1 year, and will continue to gain strength until CH is consumed. Superior ASR mitigation. Class 3 sulfate exposure rated. The alkali-silica reaction (ASR) can be mitigated or eliminated in regions with reactive aggregate using HessPozz as an SCM. HessPozz blended cement protects steel reinforcement by creating a concrete matrix so densely packed that corrosive liquids and/or gases cannot penetrate.